I love my OB. He is really meticulous, caring, aggressive in treating what I have and ruling out all options. However, my OB is part of a large OB group. The group has a phone bank of receptionists that take in all the calls and relay messages back to each of the doctors. I do not like these receptionists. They brush me off when I call with statements like, “Well that just isn’t high on their priority list because they have urgent situations they have to deal with.” They are usually pretty rude too. It is impossible to actually be transferred to one of the staff members in my doctor’s office. The staff members back there know me and my situation and are always so compassionate. That is why on occassion I have had to just go in without an appointment or not wait for my message to be relayed to my doctor. I always feel like I have to bypass the phone bank. I’m not a person who really likes to cheat the system or cheat in general, but sometimes I guess you just have to in order to make sure you get what you need. Well I had my doctor’s appointment today. Getting ready for and going took everything out of me. I am so exhausted! Got to listen to the heartbeat again. He found it much faster. It’s getting less awkward. I brought up the nausea thing, but he says I have improved so I shouldn’t worry. He thinks this will all be over with soon. I haven’t thrown up since Monday or Tuesday (can’t remember exactly) so I’m doing OK.
Everything was taking a really long time. So I missed my ultrasound appointment, but it was booked wrong anyway. So they rescheduled it for next week. That means no lovely ultrasound picture for all of you and it also means that Stephen will have to miss that appointment. Our church is going to be providing meals for us twice a week now, which will be really nice. Anyway, I’m tired so that’s it for now. So Stephen and I discovered last night that baths are much warmer and more practical than showers. I can sit in the warm water and stay warm the whole time — no violent shivering. I can also rest my arm on the side of the tub instead of having to hold it up like a kid with the answer to the question in class. It’s also easier to get my hair washed and rinsed without getting my arm wet. Overall the experience was just much better than trying to shower. One thing I did ponder in the tub: how do you shave your legs once you have the belly? That’s going to be hard. Speaking of belly, my weight is still fluctuating and not stabilizing. I don’t care if everyone knows my weight at this point, I’m not embarassed after all this. Pre-pregnancy I was 146. The day I found out I was pregnant I weighed 148. Last week I got down to 137. This weekend I went back up to 141. Yesterday I was 138. It’s something definitely to discuss with my doctor. At the most it’s only 6% of my pre-pregnancy body weight (I think I’m doing my math right), but still. When everyone you know keeps commenting on how thin you look it just feels a little weird, especially when you’re pregnant. Another thing I want to discuss with the doctor is the link between hyperemesis and liver function. One of the ways I know I was pregnant and had a miscarriage last year is that my liver enzyme levels were really high at the time for no “apparent” reason. This happens naturally when you are pregnant, but my regular doctor started testing for all these autoimmune diseases because we didn’t know that I was pregnant. 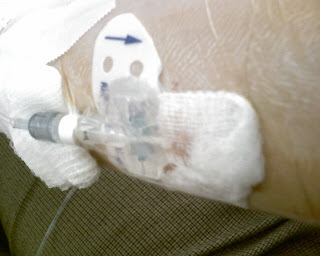 After I had what I thought was just a really crummy and painful cycle, the levels went back down to normal. I know my liver is working overtime right now processing baby’s stuff, my stuff and my out of control pregnancy hormones. I wonder if there is a link to this and me feeling crappy. I also wonder if anything can be done about it. Yesterday our pastor’s wife graciously brought a bunch of food to Stephen’s work for us to enjoy over the next few days. We got some corn chowder (which I had been craving thanks to an episode of Take Home Chef yesterday), veggie soup, a whole cooked chicken, bananas, strawberries and some huge rolls. I was able to eat the corn chowder for dinner and it stayed down. So yesterday I got in that, a smoothie and a glass of juice. I did throw up once, but no food came back up. Last night Stephen’s parents came over for dinner. I didn’t feel very good. I didn’t eat. Then I threw up most of my lunch. I’ve felt pretty crappy ever since. Throwing up actual food is worse to me than water or bile. It stinks so bad. Like literally smells horrible. I don’t want to stop eating or anything, but ew! I threw up this morning too. I finally managed to eat one of the burritos left over from last night. I basically forced myself to eat it. Not sure if it is going to stay down yet. I just took some Zofran and hopefully that helps keep it down. Stephen’s mom is getting a list started at the church for people to bring us meals a couple times a week for the next couple months. Hopefully I feel better by then. It was fun having someone here all day too. I even made it to the grocery store.